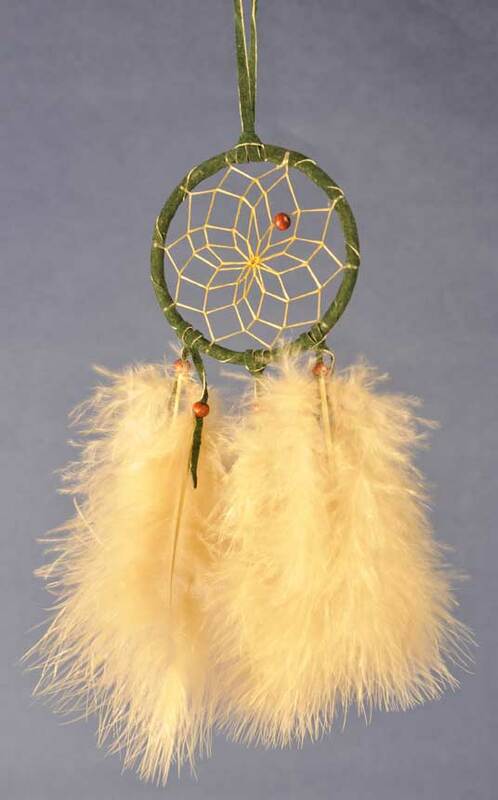 One of the most beautiful stories in American Indian Mythology, it is said that both good dreams and bad dreams circulate in the night air. The loop, its center woven in a web-like pattern, allows the good dreams to pass through the web into the sleeper, but makes bad dreams become entangled in the web, where they perish at the first light of dawn. The hoop is wrapped in leather and there is a single transluscent bead woven into the web. Transluscent faceted beads are strung above the bottom fluffs. Colors may vary from those shown. 2.5 inches in diameter. Made in Canada by a Native owned company. The hoop is wrapped in leather and there is a single metal bead woven into the web. Colored faceted beads are strung on the top thong and above the bottom fluffs. Colors may vary from those shown. 2.5 inches in diameter. Made in Canada by a Native owned company. 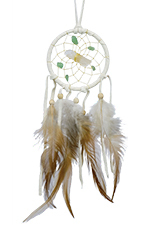 Vision Seeker Dream Catchers are designed to capture bad dreams to the web, and allow good dreams through. The quartz assists in removing negative thoughts. The stones enhance spiritual communications and guidance. Woven in the web are small semi-precious stones that may include amethyst, turquoise, tiger's eye, citrine, or aventurine. A large quartz crystal is in the center. 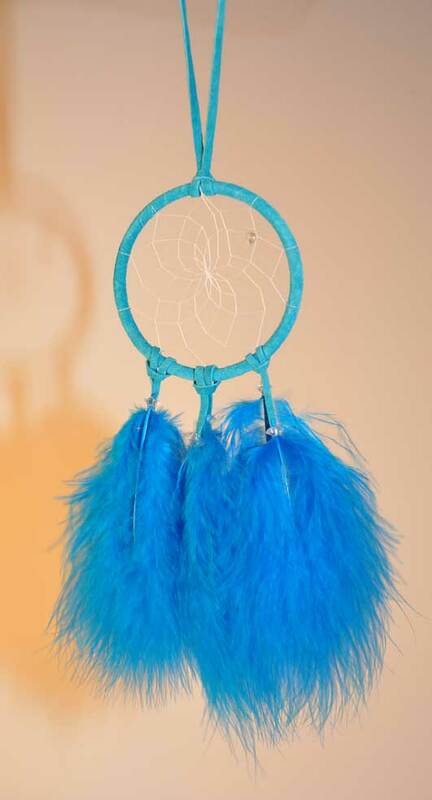 Natual colored hackles with small wood beads dangle below. Made in Canada by a Native owned company. The hoop is wrapped in leather and there is a single bead woven into the web. Airy fluffs dangle from the bottom (fluff colors may vary from those shown). 2.5 inches in diameter. Made in Canada by a Native owned company.